January | 2012 | Things That Go [BLEEP]! Mass Effect, the great single player franchise has just been thrown a curveball. I’m assuming through the nudge of EA. Let’s just say that when I heard that multiplayer was coming to the Mass Effect franchise, I was far from pleased. I expected them to make a basic multiplayer versus playlist like all other games. Then I read that the multiplayer was in fact cooperative missions. So then I went on to think that they’re just taking what Epic Games and others have done and just implemented it into the game. Though not a lot of details have been announced on how this multiplayer will actually affect the single player campaign, it is known that it does help boost Shepards’ “Galactic Readiness” which consists of gathering people, resources, weapons, armies and fleets through a variety of platforms and interfaces. Resident Evil 6 Announced – With Video!!! Resident Evil 6 will be getting the pre-order incentives from GameStop, Best Buy and Amazon. Retailers will each get an exclusive map that will function with various modes in the game. When more details are announced we will post back as to which retailer is getting what pre-order bonus. Resident Evil 6 will launch 11/20/2012. Microsoft has recently reduced quite a bit of content for the month of January. From Arcade, Add-ons, and Games On Demand. I know I’ve probably hyped this game up on my site a lot here recently. Truthfully, I think this will be one of the best new IP’s to come out this year. The creative talent alone behind this video game should warrant at least a look. So, take a look! If you’re still unsure if you will like this game or not, I have two questions for you. If you answer yes to both, then you need to buy this game new, not used. 1). Do you like the battle system in the Fable series? 2). Do you love the open world epic RPG games? This is a day one purchase for me. I suggest you at least try the demo before writing this game off. The demo releases January 17th. Try it out. What do you get when you cross the fantasy world of Amalur and the galaxies of Mass Effect? The answer: Some cool, unique in games items for you to use at your disposal. How do I get these you ask? By playing the demos of each game you unlock content within the opposite game. The demo for Kingdoms of Amalur: Reckoning launches January 17th. 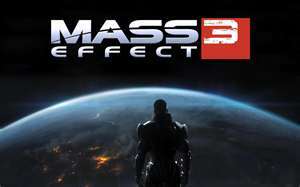 No release date has been announced for the Mass Effect 3 demo, but I would expect it sometime in Feburary. Reckoner Knight Armour:This armour will maximize damage done in close-quarters combat while a beefed—up power cell feeds energy into weapon systems to increase projectile velocity. N7 Armour:Players can unlock special armour inspired by Commander Shepard’s iconic N7 battle armour including Helm, Cuirass, Gauntlets, Chausses and Greaves. Also, you get these exclusive in-game items for playing the Kingdoms of Amalur: Reckoning demo for the full game when it releases Feburary 7th. Twist of Fate Card:This card boosts the player’s ice resistance and is immediately unlocked when he or she activates the Reckoning demo using his or her Origin account. Twinned Souls Chakram:A unique weapon that damages enemies while boosting player health and mana in Reckoning. So, will you all be trying out these demos? Both of these games are high on my priority lists so I’ll definately be playing the demos of both, then buying both as well. How about you all? Tomorrow marks the first freemium game to hit the WP7 Xbox Live marketplace called: Bug Village. For those of you who play on Facebook, you should know this means. Meaning you can play the game without having to spend any real world money, but to get the best stuff it’s almost always required to spend a little extra money. The good news is that you will be able to get the whole 200 Gamerscore without buying any extra content, or so they claim. This week’s Windows 7 Phone Deal Of The Week is none other than Implode! If you haven’t played Implode! you’re missing out, that is if you like games like Angry Birds. Implode! will be on sale for one week for $1.99 from it’s original $2.99 pricing. Click here for the achievements for Implode!